Patsy offers a set of specific stateful transforms (for more details about stateful transforms see Stateful transforms) that you can use in formulas to generate splines bases and express non-linear fits. 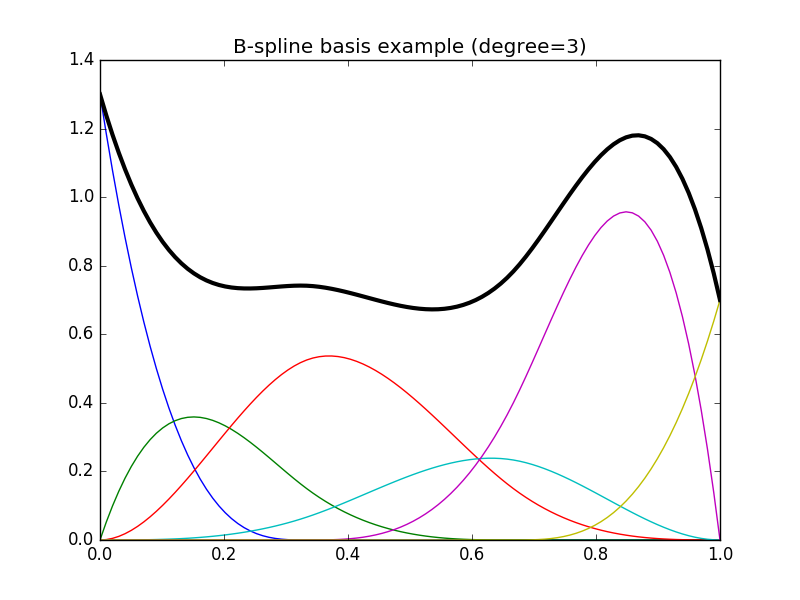 bs() can produce B-spline bases of arbitrary degrees – e.g., degree=0 will give produce piecewise-constant functions, degree=1 will produce piecewise-linear functions, and the default degree=3 produces cubic splines. The next section describes more specialized functions for producing different types of cubic splines. 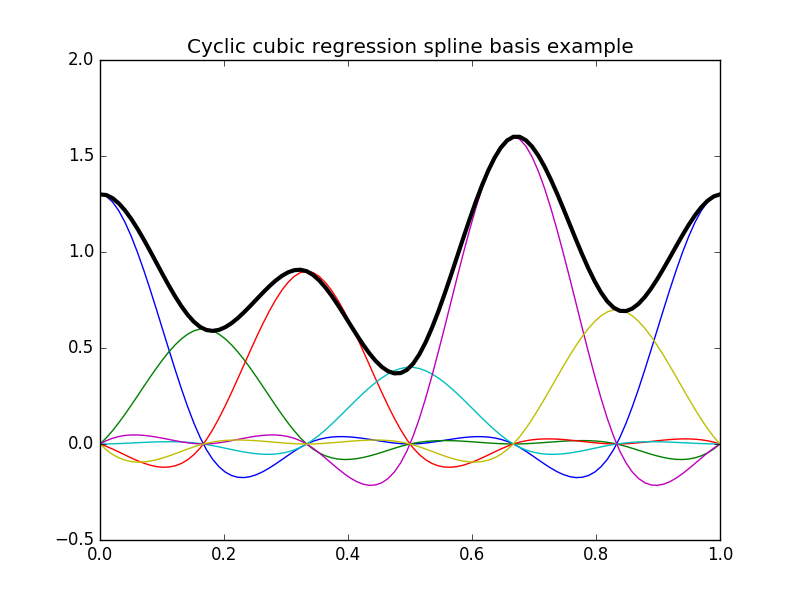 Natural and cyclic cubic regression splines are provided through the stateful transforms cr() and cc() respectively. Here the spline is parameterized directly using its values at the knots. These splines were designed to be compatible with those found in the R package mgcv (these are called cr, cs and cc in the context of mgcv), but can be used with any model. Note that the compatibility with mgcv applies only to the generation of spline bases: we do not implement any kind of mgcv-compatible penalized fitting process. 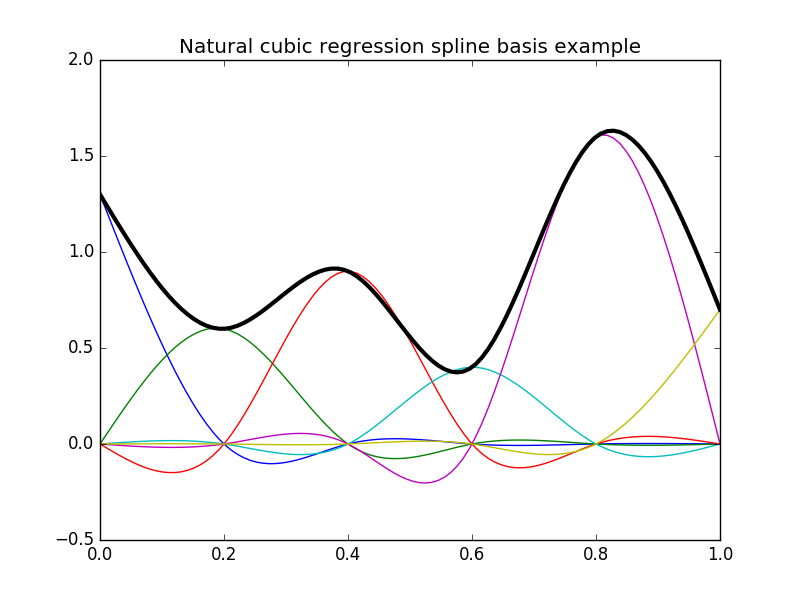 Thus these spline bases can be used to precisely reproduce predictions from a model previously fitted with mgcv, or to serve as building blocks for other regression models (like OLS). Note that in the above example 5 knots are actually used to achieve 4 degrees of freedom since a centering constraint is requested. In patsy one can specify the number of degrees of freedom directly (actual number of columns of the resulting design matrix) whereas in mgcv one has to specify the number of knots to use. For instance, in the case of cyclic regression splines (with no additional constraints) the actual degrees of freedom is the number of knots minus one. In patsy one can specify inner knots as well as lower and upper exterior knots which can be useful for cyclic spline for instance. In mgcv a centering/identifiability constraint is automatically computed and absorbed in the resulting design matrix. The purpose of this is to ensure that if b is the array of initial parameters (corresponding to the initial unconstrained design matrix dm), our model is centered, ie np.mean(np.dot(dm, b)) is zero. We can rewrite this as np.dot(c, b) being zero with c a 1-row constraint matrix containing the mean of each column of dm. Absorbing this constraint in the final design matrix means that we rewrite the model in terms of unconstrained parameters (this is done through a QR-decomposition of the constraint matrix). Those unconstrained parameters have the property that when projected back into the initial parameters space (let’s call b_back the result of this projection), the constraint np.dot(c, b_back) being zero is automatically verified. In patsy one can choose between no constraint, a centering constraint like mgcv ('center') or a user provided constraint matrix. Smooths of several covariates can be generated through a tensor product of the bases of marginal univariate smooths. For these marginal smooths one can use the above defined splines as well as user defined smooths provided they actually transform input univariate data into some kind of smooth functions basis producing a 2-d array output with the (i, j) element corresponding to the value of the j th basis function at the i th data point. The tensor product stateful transform is called te(). 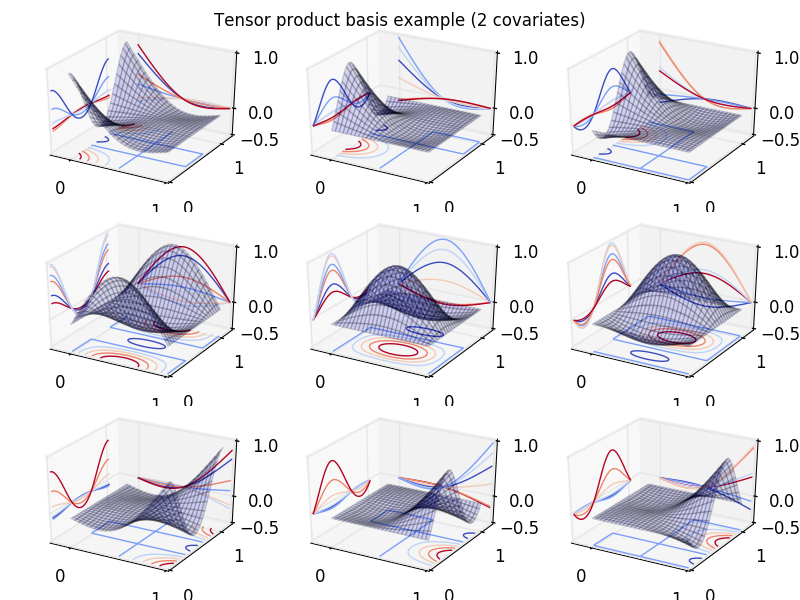 The implementation of this tensor product is compatible with mgcv when considering only cubic regression spline marginal smooths, which means that generated bases will match those produced by mgcv. Recall that we do not implement any kind of mgcv-compatible penalized fitting process.